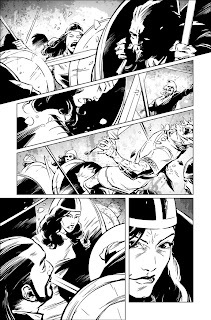 1) Guinevere is swinging her sword down at soldiers! 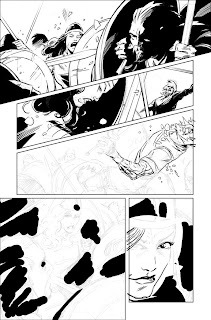 She's killing in a berserk battle frenzy! 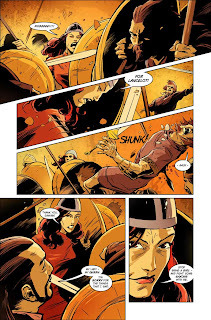 2) She batters away a sword as a Saxon runs up behind her, unseen, axe raised high to kill her! 3) A sword, thrown, shunks into the back of the Saxon, wide eyed in his death! 4) Gawain pulls his sword out of the Saxon's back as he speaks to Guinevere. I'm sorry for the things that i said. Stop being a girl - and fight some saxonswith me. 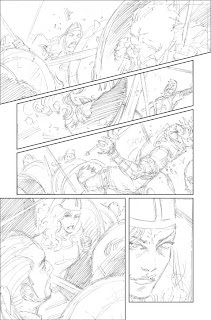 Step 2, pencils - changes from script: enemy attacks from over the shield wall, and is killed by a spear.